The Rakit Metal Synth has a Polivok’s inspired filter at its core. It uses this, along with a punchy AD envelope to produce a variety of percussive sounds from shaped noise. 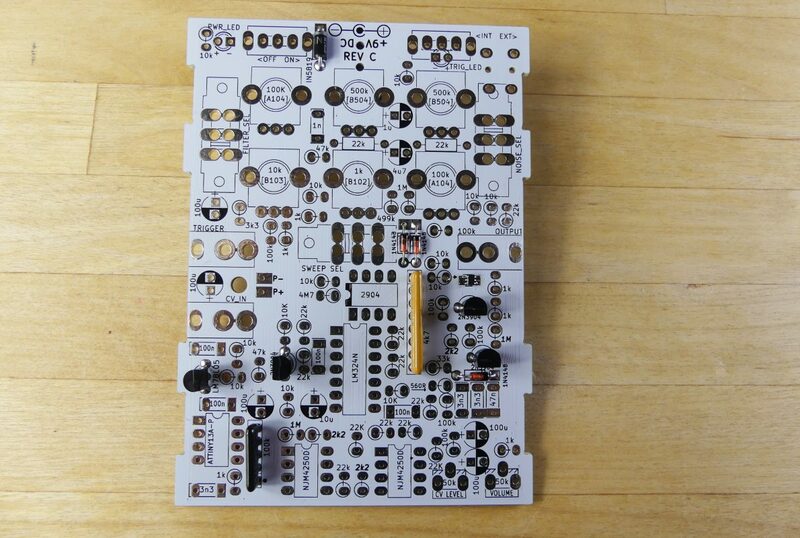 The filter is switchable between band pass and low pass modes and a resonance control featuring self oscillation at high resonance settings. 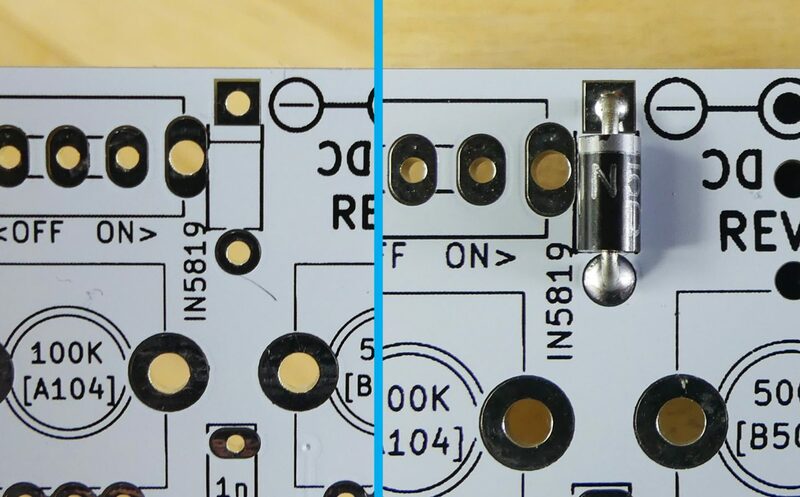 The synth is triggered by a piezo disc (or trigger input) which is sensitive to how hard you tap the top panel giving subtle differences in the envelope. There are a lot of small components included in the kit so please open the packaging carefully and check that all parts are present and correct using the parts list below before you start. Place the IN5819 schottky diode as shown. The band on the part should be aligned with the band on the silkscreen. Note: The diodes are polarity sensitive and will not work in the wrong orientation. 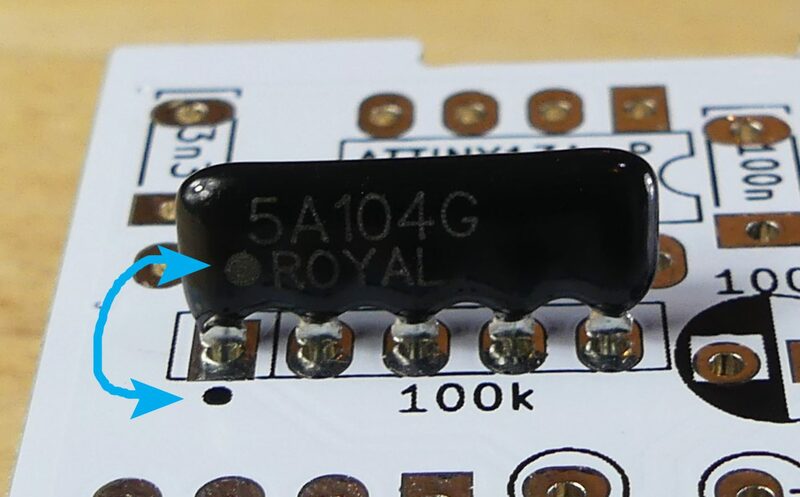 Place 3 x 1N4148 diodes, this time the black end of the diode should correspond with the silkscreen. Two of these are next to each other in the centre of the board. Find the 5 pin resistor marked 5A104G, this needs to be correctly orientated to work properly. Match the dot on the side with the dot on the silkscreen then solder in place. 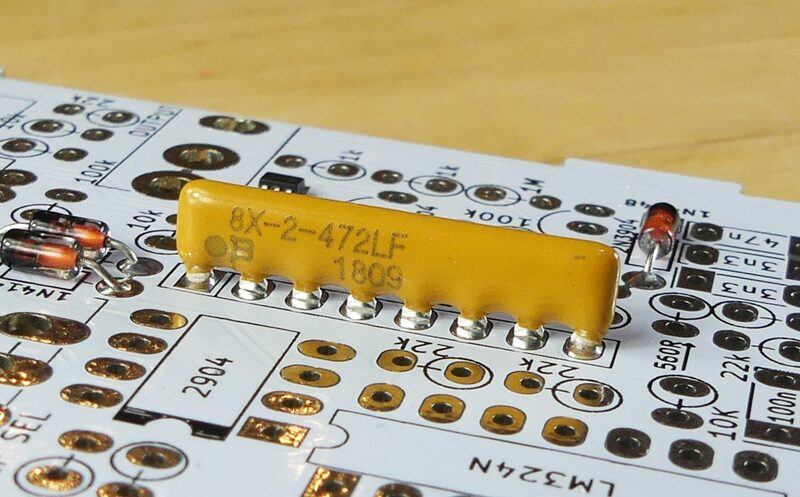 Locate and insert the 8 pin resistor network, which doesn’t need a specific orientation – however, it’s good practise to put pin 1 at the marked (square) end of the silkscreen. 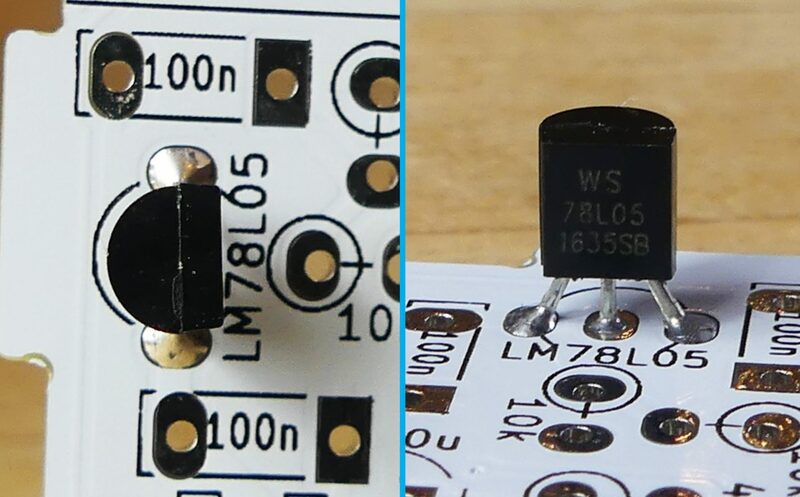 Find and place the single 78L05 voltage regulator. The circular back should correspond to the the image on the board, with the part number facing the front. Ensure the T0-92* is pushed into place so it won’t interfere with the front panel later. Level with or slightly taller than the DIP/SIP packages is fine. *name origin: Transistor Outline Package, JEDEC – Case Style 92. 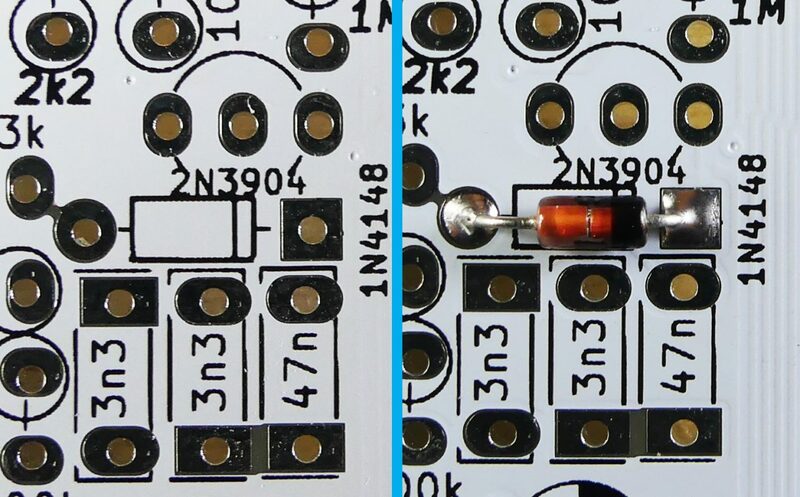 Repeat the same steps for the remaining three 2N3904 transistors. 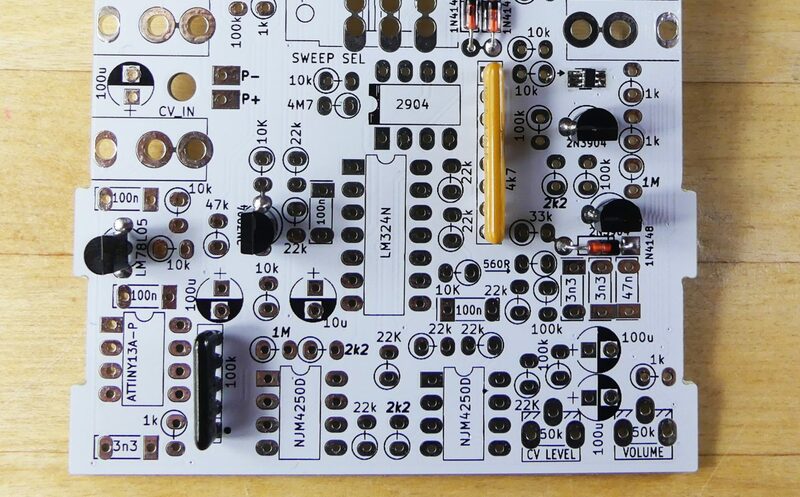 You should now have all the diodes, resistor networks, transistors and voltage regulator in place. Looking good!